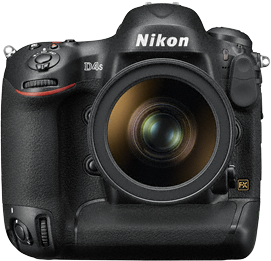 Nikon has just announced its new D4s flagship DSLR camera. As this is basically an 's' update to the current D4, the improvements aren't earth shattering (e.g., no 24MP sensor as many, including myself, had hoped for). There are still numerable improvements worth checking out though, most notable in ISO (a whopping 409,600 is now available), video (1080p/60fps), frame rate (now 11fps with AF and AE), a new S-RAW format (half the size), and a Gigabit Ethernet connector. The initial price for the D4 is around $6,499/€6,149 and should start shipping on 6 March. Compatible lenses AF NIKKOR lenses, including type G, E, and D lenses (some restrictions apply to PC lenses) and DX lenses (using DX 24 X 16 1.5X image area), AI-P NIKK OR lenses, and non-CPU AI lenses (exposure modes A and M only). IX NIKKOR lenses, lenses for the F3AF, and non-AI lenses can not be used. White balance Auto (2 types), incandescent, fluorescent (7 types), direct sunlight, flash, clo udy, shade, preset manual (up to 6 values can be stored, spot white balance measurement available during live view), choose color temperature (2500 K– 10000 K), all with fine-tuning. Movie - ISO sensitivity In exposure modes P, S, and A, auto ISO sensitivity control (ISO 200 to Hi 4) with selectable upper limit. In exposure mode M, auto ISO sensitivity control (ISO 200 to Hi 4) available with selectable upper limit; manual selection (ISO 200 to 25600 in steps of 1/3, 1/2, or 1 EV) with additional options available equivalent to approximately 0.3, 0.5, 0.7, 1, 2, 3, or 4 EV (ISO 409600 equivalent) above ISO 25600.